Gabriel Merrick plays with fire. Literally. Sometimes he can even control it. And sometimes he can’t. Gabriel has always had his brothers to rely on, especially his twin, Nick. But when an arsonist starts wreaking havoc on their town, all the signs point to Gabriel. Only he’s not doing it. And no one seems to believe him. Except a shy sophomore named Layne, a brainiac who dresses in turtlenecks and jeans and keeps him totally off balance. Because Layne has a few secrets of her own. There are so many reasons why this series is the #1 series for me this year. This book in specific just had so many things in it that made it so special. In general, this series has many reoccurring plot aspects that haven’t gotten old… yet! It always has a Merrick brother and a girl with issues and baggage. Somehow, miraculously, Brigid Kemmerer makes it work every single time! 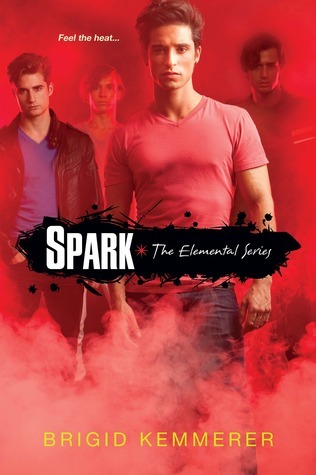 In Spark, it was about (½ of my favorite Merrick twins, the only Merrick twins…) Gabriel Merrick and his love interest Laine. I really enjoyed this story because the characters are so real. I think it’s because the Merrick’s are named after Brigid’s kids and probably have similar characteristics that make their characters so much stronger. She captures the depth of a real person into a fictional one, and I can really connect. I love these books! I totally recommend them!